The Window Factory Ultrashield Patio Doors are crafted for smooth operation and beautiful design. Our sliding doors feature a contemporary look with a sleek, narrow frame that will maximize your glass area. Engineered for smooth operation and secure performance, these patio doors glide on The Window Factory's dual ball-bearing rollers with self-contained leveling adjusters. • Solid, secure construction. Multiple locking points offer an added level of security. • Energy-efficient design. Continuous weatherstripping and interlocking design features help keep your home draft-free and provide energy savings, too. • Climate-efficient performance. Easy operation even in the harshest of climates. The Ultrashield Sliding Patio Doors are crafted from a proprietary blend of premium vinyl, which marks the distinction when crafting for superior results. 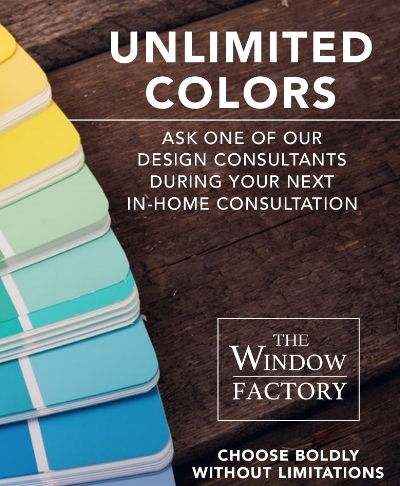 Designed with you in mind, all of our windows are manufactured in the USA and come with The Window Factories newest features in hardware and security for a lasting impression. Our sliding patio doors open by sliding along horizontal tracks at the head and sill. 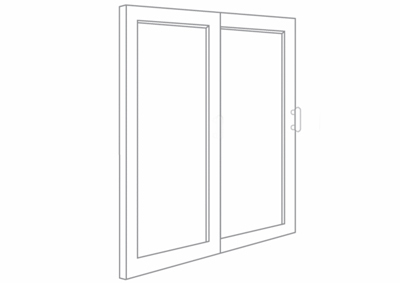 A sliding door can be designed for either a right-hand or left-hand operation. While hinged doors open inward or outward, sliding doors does not require swing room and can accommodate tight-fitted spaces. Looking for a more classic, traditional style for an exterior door? Try our sliding French door. The French doors are also available in in-swing and out-swing hinged versions. All UltraShield Doors were designed with security in mind combining two heavy-duty hooks that push outward to engage the keeper, which securely locks the door at the jamb. The sliding screen doors are built with flush-mounted handles and self-latching, heavy-duty hardware.